…is what this gathering of Brownies was dubbed in 1973. As part of a nationwide initiative aimed at improving and cleaning up the environment, they worked for two months raising money to buy two flowering trees for their school. Now 41 years old, the cherry tree they planted – with the help of senior boys who dug and filled in the holes – still graces the Russell School entrance. Another was planted later to make a pair. The fate of the second tree planted that day – an Indian Bean – is unknown. The tradition of gardening at the school has recently been resurrected. Looking at the school grounds by the swimming pool you will see a fence largely obscured by lush and healthy climbing vegetables. Stalwart volunteers Mandy and Sandy help maintain a school vegetable garden, whose purpose is to introduce children to the wonders of gardening and to encourage eating of the produce. Every week eight children from two different classes are chosen on a rotational basis to help work the garden and maintain fruit trees around the school grounds. For their efforts they choose vegetables to take home to their family. A unique feature of the gardens is a pataka built by Mandy’s partner Sam. The design is based on a traditional Māori storage hut where seeds are stored before being used as the seasons dictate. Whilst the aim of the garden is to provide fruit and vegetables for the children, the surplus, along with their world famous worm wee, is sold at the school market, held on the last Sunday of each month. 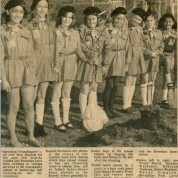 These 1973 brownies are, from left to right: Tracy Rewiri, Deidre MacInnes, Deborah Thompson, Debra Wrathall, Wendy Simpson, Seraphine Pick, Carol Jones, Charmaine Wood.